Now well into our third decade as a small artisan winery, we specialize in high quality red wines. We make wines that we like to drink; in our case that means wines with complexity, good balance, and sufficient acidity and tannins to age well and complement a meal. By paying close attention to matching our vines with their microclimate, we produce wines with good fruit and varietal character at a moderate alcohol level. We love classic style wines - wines that can age and improve for decades, that are multi-dimensional, and that are not excessively oaked, and that is what we try to make. 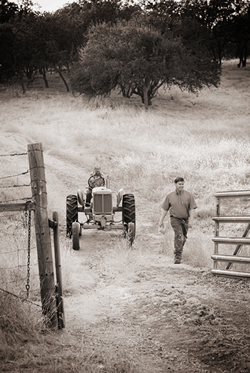 Our winery is truly a father-and-son operation. All Caparone wine is made by my father, Dave Caparone and myself, without any employees. One of the most experienced winemakers in Paso Robles, my father has made wine every year since 1973. In 1979, he founded Caparone Winery to focus on the wines he loved best: full-bodied red wines, made in a classic style, with uncompromising commitment to quality. Over the years, the winery has stayed true to that goal, producing small amounts of Cabernet Sauvignon, Merlot, Zinfandel, Sangiovese, Nebbiolo and Aglianico. We believe that the best wines are possible when these conditions are met: grapevines are planted with careful regard to microclimate, fruit is harvested at the exact moment of maturity, and wine is made with as little processing as possible. In other words, careful handling of nature is the key to fine winemaking. We do not fine or filter our wines, and take no shortcuts to put them in the bottle sooner, leaving each for two years in small oak barrels. The resulting wines give all that the grape has to offer, wines that will continue to develop in the bottle for many years. The three noble red varietals of Italy - Sangiovese, Aglianico and Nebbiolo, have been of particular interest to us. Dave began his work with Nebbiolo, one of his favorite wines, in the mid 1970's, and planted it at the winery in 1980. A grape that requires careful clonal selection, it has been a delight and a challenge to work with. Currently we use what we believe is one of the finest available clones of Nebbiolo, isolated by the University of Turin. Our efforts with Sangiovese began in 1982, when my father obtained some Sangiovese Grosso cuttings from one of the most respected producers of Brunello di Montalcino. We produced the first American varietal Sangiovese from those vines in 1986, and they continue to produce outstanding wines every year. We introduced the third great Italian grape, Aglianico, to the United States in 1992. Sourced from some cuttings imported a century ago, found in an obscure plant library, it has thrived in our vineyard, producing a wine with startling varietal character. Our motto - 'simple winery, complex wines' applies not only to our grape growing and winemaking, but to our business as well. We are not interested in charging high prices for our wines, rather, we strive to give great value for our price. As vintners who make wine for the sheer enjoyment of it, we are much more interested in developing satisfied, long-term customers than in dazzling consumers with sky-high prices. Interesting, high quality red wines, sold at an honest price - that is what Caparone Winery is about.